The Jersey Shore Boca men’s under-23 and under-20 teams have reached the mid-season break in the Mid-Atlantic Summer Showcase League as both teams get a weekend off before continuing their final month of the 2005 summer soccer season. Both Boca teams hope to improve their overall league records when MSSL play resumes in July and will look for wild-card berths to the USASA regional tournaments. 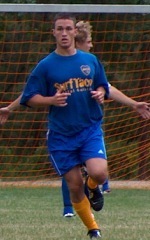 TOMS RIVER, NJ (June 29, 2005) – The Jersey Shore Boca men’s under-23 and under-20 teams have reached the mid-season break in the Mid-Atlantic Summer Showcase League (MSSL) as both teams get a weekend off before continuing their final month of the 2005 summer soccer season. Both Boca teams hope to improve their overall league records when MSSL play resumes in July and will look for league wild-card berths to the United States Adult Soccer Association (USASA) U-23 and U-20 regional tournaments held next month. The Boca U-23 team has an overall record of 4-8-2 thus far for the summer including seven exhibition games and a 2-5-0 record within MSSL. In their latest league games last Sunday at Winslow (NJ), the Boca U23s defeated FC Hudson (NJ) 2-0 in the first game and dropped a tough afternoon match 4-0 against Milmay FC from South Jersey. Statistics for the Boca U-23s in their seven MSSL games include Justin Fuccello (Brick) 2 goals and 2 assists; Oren Solon (Bayville) 1 goal and 1 assist; Ryan Campbell (Pt. Pleasant) 1 goal; Carlos Ruthner (Delran) 1 goal and Brandon McGauley (Lacey) 1 assist. Boca U-23 goalkeepers John Plaugic (Kearny) and Eugene Hahn (Roselle Park) have given-up 16 goals in seven MSSL games and have a combined goals against average of 2.29 per game with Hahn picking-up the shut-out last Sunday. “I’m happy to have the opportunity to coach such a good group of players. However, at this level, I’m really just an administrator as these kids should all know what to do by now. At times during our first seven league games, they have shown a tremendous amount of character, determination and heart and we will need to improve and maintain that focus from everyone for every game throughout the second part of our season. If we do, we should be in pretty good shape” mentioned Steve Ruch who coaches the Boca U-23 team. The Boca U-20 team holds an overall record of 6-6-2 for the summer also including seven exhibition games and a MSSL league record of 3-4-0. Last Sunday, the Boca U-20s traveled to Montvale (NJ) and lost a heart breaker to powerful Silver Lake of Staten Island (NY) 5-3 after the game was tied 3-3 with less than 5 minutes remaining. In the second match the Albertson Soccer Club U-23 team from Long Island (NY) topped Boca 4-1. The Boca U-20 stat leaders in seven MSSL league games include Andrew Perez (Brick) 5 goals; Justin McGrath (Brick) 3 goals and 1 assist; Mark Schmiegel (Toms River) 2 goals and 3 assists; Versh Tivzenda (Hoboken) 3 goals; Eric Davis (Lakewood) 1 goal; Chris McGreevy (Hoboken) 1 goal; Manny Neivens (Hammonton) 1 assist; Mark Petruniak (Hightstown) 1 assist; Christian Pontier (Lacey) 1 assist and Casey Zambor (Jackson) 1 assist. Boca U-20 goalkeepers Chris Konopka (Toms River) and Jon Curry-Edwards (Spring Lake Heights) have a combined for a 1.43 goals against average in seven MSSL league games. Konopka has recorded two shut-outs and allowed only one goal in three MSSL games he has played. “I feel the under-20 team is playing very well at this point in the summer. When you think about it, they are really still getting to know one another. Even during our two tough losses last Sunday in ninety degree heat against two quality opponents, you saw some flashes of brilliance that this group is capable of achieving. They just need to defend a bit better and finish more of their scoring opportunities, which were plentiful last Sunday, and the team should do alright for the second part of the season” mentioned Boca U-20 coach Walt Konopka who also directs Boca’s overall men’s summer program. “Over the summer, collegiate soccer players need to improve their strength and fitness, sharpen their tactical skills and gain as much competitive game experience as possible in a high-level environment. I believe our men’s summer soccer program with our participation in MSSL, affords our players the opportunity to accomplish these goals. Players on both our summer teams can attest to that” finished Konopka.